I'm so in love with these bunnies, so I'm thinking about using them for my daughter's birthday. The only problem is that she's in high school. I'm sure she will find the humor in this and if not I assure you she so deserves this after all of the teenish things she does. I'm sure you know what I'm talking about and if you don't you will know soon enough. Anyhow, the bunny rabbits are available in black, my favorite, and brown. Select your favorite invitation to view additional details and edit. 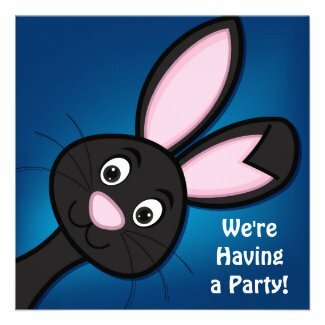 For even more invites take a look at Cute Bunny Rabbit Personalized Birthday Invitations.